At the mention of Hiroshima, most people immediately think about the first atomic bomb and the devastation it caused. It will forever be what Hiroshima is known for. It also is the main reason why tourists come to visit Hiroshima. Regardless of what our guidebook led us to believe, there was more to Hiroshima than the Atomic Bomb Dome and Peace Memorial Park. Our favourite place turned out to be Hiroshima Castle, which was strangely missing from one of our guidebooks. 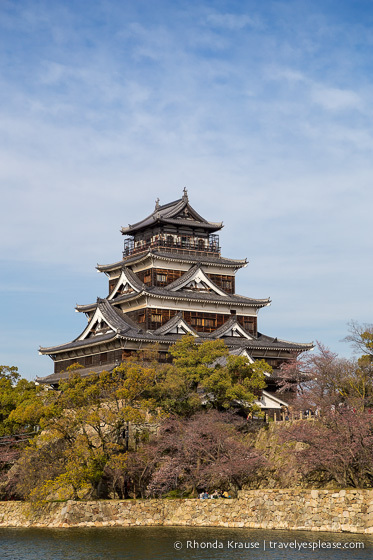 Hiroshima Castle was established in 1589 by Mori Terumoto, one of the “Five Great Elders” of Toyotomi Hideyoshi’s council. Terumoto lived in the castle from 1591 until 1600, when the Battle of Sekigahara forced him to retreat to the present day Yamaguchi Prefecture. The new lord, Fukushima Masanori took over the castle. Masanori occupied Hiroshima Castle until 1619, when he was dismissed for restoring the castle without permission of the Tokugawa shogunate. Asano Nagaakira then became lord. Hiroshima Castle was occupied by 12 generations of the Asano family until 1869, when the feudal system was abolished during the Meiji restoration. The castle gradually transitioned into more of a military facility with the Imperial General Headquarters being established here. During World War II, Hiroshima Castle continued to be used for military purposes, with the 2nd General Army having their headquarters here. As a result, the castle and other military and industrial facilities in Hiroshima became legitimate targets for an Allied attack. On August 6, 1945, Hiroshima Castle and the rest of the city were destroyed by the blast from the first atomic bomb attack. The site of Hiroshima Castle went on to be designated a national historic site in 1953. Four years later, in 1957, rebuilding of the main keep began and was completed the following year. Hiroshima Castle was the first Japanese castle we visited during our two weeks in Japan, so I was immediately impressed! Before entering the castle grounds, we walked along the perimeter of the moat that circles the complex. Some of my favourite views of the castle were from here! Continuing around the moat, we eventually came to the back entrance of the castle. After climbing a set of stone stairs, we entered the Honmaru, or main compound. The first thing we saw in the Honmaru were bits and pieces of stone laying in the grass, some larger pieces arranged in the shape of a building. These were the ruins of Hiroshima’s Imperial Military Headquarters. There were a few other areas of ruins, marking the places where buildings had stood before the atomic blast. Past the ruins, in the far corner of the complex, is the castle’s most prominent structure- the main keep (also known as the donjon, or tower). With every step we took up the steep staircase, the tower slowly came into full view. The architectural style of the main keep was distinctly different from the European castles I love so much. The exterior was mainly made from wood, instead of stone. Also, the embellishments along the rooflines gave it a much more artistic, pleasing appearance than that of an imposing fortress. Inside the donjon are many exhibits illustrating the history of Hiroshima, the castle, and what life was like in a castle-town. I briefly looked at them as I circled around to the stairs, excited to get to the top of the tower. Four floors of exhibits later, I reached the top of the tower. There was a nice panoramic view of the city, but unfortunately I couldn’t fit my camera lens through the holes in the safety fence, so you’ll just have to trust me on that one! After enjoying the views, I headed back downstairs and outside to admire the main keep some more. It was so pretty, I couldn’t get enough! After tearing myself away from the main keep, we went to visit the Hiroshima Gokoku Shrine, a Shinto shrine built within the confines of the castle walls. Ladles at the purification fountain near the entrance to the shrine. The shrine was quite modest compared to others we saw during our time in Japan. It also was a lot newer, having been rebuilt in 1945 after the atomic bombing. Although I wasn’t overly impressed with the architecture of the shrine, we did enjoy taking some time to read our fortunes. A lot of people left their fortunes tied to the fence outside the main hall, so we did the same. In hindsight, I wish I had kept mine. I don’t even remember what it said! As the sun was starting to set, we decided we better make our way towards the exit at the Ninomaru. The Ninomaru is the second compound (second circle of defense) of Hiroshima Castle. The main structures of the Ninomaru are two turrets adjoined by a long storehouse and the main gate to the castle. Both have been faithfully reconstructed using original building methods and materials. I was definitely glad we saved enough time after visiting the Peace Park to explore Hiroshima Castle. If we had only visited the Atomic Bomb Dome, we would have been exposed to just one aspect of Hiroshima’s past. The exhibits in Hiroshima Castle gave a more well-rounded history of Hiroshima. Plus, we learned a lot about Japanese castles in general. Hiroshima Castle is beautiful, interesting and definitely worth a visit if you’re ever in Hiroshima! The main keep/tower is open from 9:00 am- 6:00 pm (March-November) and 9:00am- 5:00 pm (December- February). Last admission is 30 minutes before closing. The main keep is closed December 29-31. Admission to the tower is ¥370. Access to the rest of the grounds is free. You cannot take photos inside the main keep, except in designated places. There is no restroom inside the tower, so if you need to, use the one in the park before entering. 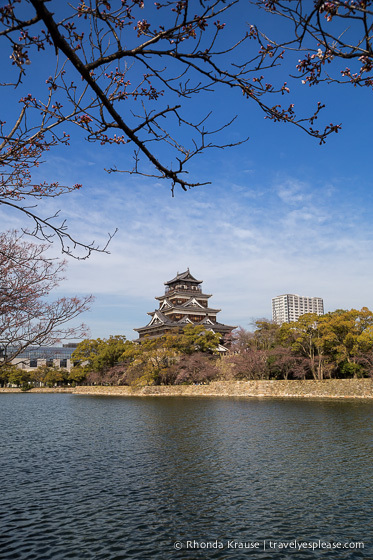 Hiroshima Castle is about a 15 minute walk from the Peace Memorial Park. For your convenience, here is a list of hotels in Hiroshima. Please consider booking your Hiroshima accommodations through the included link. It costs nothing extra and helps support this website. Thank you!